The Windsor range of wooden gates are beautifully crafted from smooth planed Scandinavian Redwood that has been pressure treated for a long life. 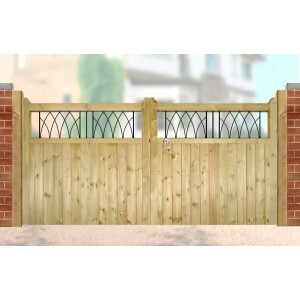 The thick frames and rear bracing has mortice and tenon joints whilst the front is clad with tongue and groove boards, giving a strong, substantial gate with a high quality finish. The Windsor gates incorporate a metal gothic panel to give the gates a stately appearance, perfect for creating a grand entrance to any property. 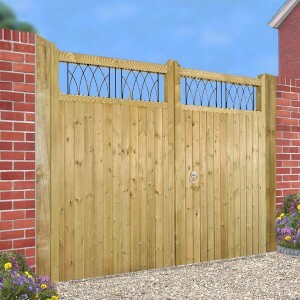 The Windsor Double Gates are an exquisite pair of solid wooden gates, with thick frames and bracing .. The Windsor Estate Gates are an exquisite pair of solid wooden gates, with thick frames and bracing .. 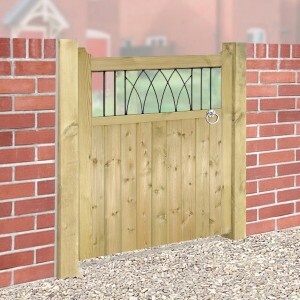 The Windsor Single Gates are an exquisite wooden gate, with thick frames and bracing accompanied wit.. 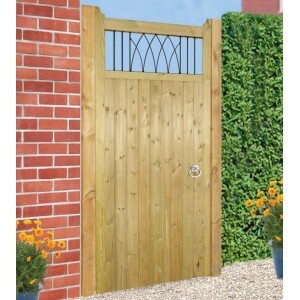 The Windsor Tall Single Gates is an exquisite wooden gate, with thick frames and bracing accompanied..